I met Roosh in Medellin about five months ago. In addition to acquainting himself with Colombia's culture (and women), he was there to finish writing his second book. 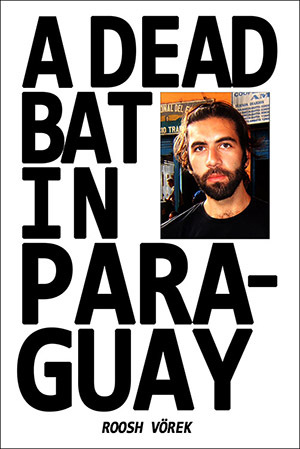 A Dead Bat in Paraguay is the memoir of his 6-month backpacking trip around South America. Roosh sets the stage for deciding to travel long term by giving readers insight into the drudgery of a microbiologist's lab work, complete with the despise he felt for his last boss. He touches on two vacations he took to Venezuela and Spain. And lastly, he tells readers of his post-college commitment to learning the art of seduction (aka “the game”). Roosh's emphasis on meeting, dating, and bedding women would ultimately come to define his journey. The adventure begins in Quito, Ecuador where differences in air pressure caused by altitude result in a bottle of personal lube exploding in his backpack, dousing his clothes and giant supply of preferred condoms. Within days, he has his pocket picked for the first time as well. Such bad luck continues to plague Roosh as he soldiers onward, providing plenty of comedy for readers. While his all-too-detailed bouts with intestinal issues are common ground for most travel enthusiasts who will read the book, he also comes across as the anti-backpacker in a lot of ways, especially early in the trip. He is content to do his own thing, often spending time alone, versus hanging out with other travelers. He considers skipping Macchu Picchu, despite being in the perfect position to visit. He experiences homesickness throughout the trip, and is perplexed by the lack of sentiment others feel toward their distant homes, families, and friends. Early in the book, as Roosh travels through Ecuador, Peru, Bolivia and Chile, his focus is on exploring the various countries while battling digestive disturbances. He shares his personal perspective on the long bus rides, concerns for personal security, and popular tourist attractions. By the time he reaches Argentina, though, a shift occurs and the focus of the book switches to the increasing urgency of his quest to earn foreign flags (the polite way of saying you slept with a local woman). Until now, his foibles around trying to game Latin women were entertaining, however as Cordoba (an Argentine college town known for its party atmosphere and beautiful women) becomes ground zero for an all out effort to end his dry streak, I found the constant reports of going to clubs and hitting on women to be a bit much. At this point, he lost me a little as a reader anxious to discover South America through his eyes, however once he moves onward to Uruguay, Paraguay, and ultimately Rio de Janeiro in Brazil, I began to enjoy his stories once again. Ultimately, A Dead Bat In Paraguay is not your typical travel memoir, and that's exactly why I enjoyed it. Roosh's book should appeal to all backpackers, though I have a hunch young men will appreciate it more. For the lady travelers, if you're curious to gain some insight into the inner workings of the male backpacker's mind against the backdrop of discovering foreign lands, you'll want to check it out too. Roosh put together a 2-minute video talking about the book and his inspiration for it. You can watch it at A Dead Bat in Paraguay. The paperback version is available on Amazon.com for $15.47, with the electronic Kindle version available for $9.99. Either option can be accessed via the book's website. As the precious time passes, Switzerland has cultivated its switzerland clothing culture and lifestyle into a highly integrated and industrial one. Thanks, I always love a good read.